AU $849,500	Now reduced Need Finance? AU $849,500	Now reduced Need Finance? Need Insurance? 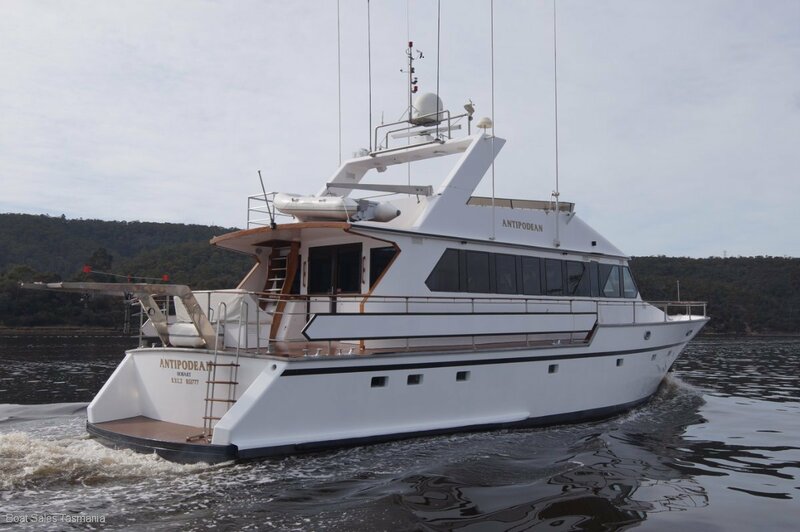 "Antipodean" is a world class blue-water motor yacht. 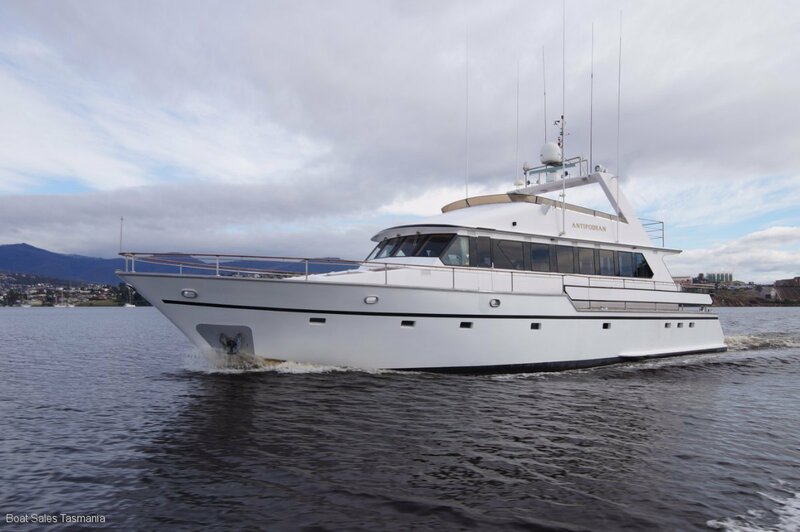 This unique vessel has been cleverly designed and superbly built to commercial survey standards. 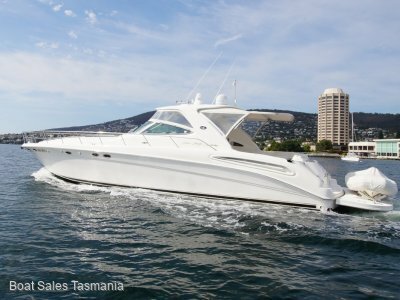 With stabilizers, bulbous bow, watertight bulkheads she is an outstanding sea boat (well proven on Tassie's West Coast). 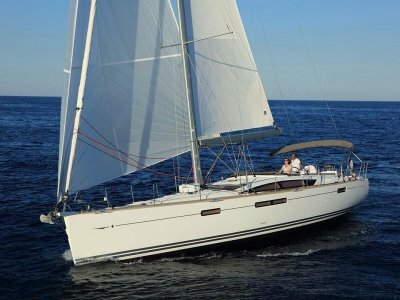 With a range of over 5500 nautical miles, "Antipodean" is quite capable of crossing oceans. 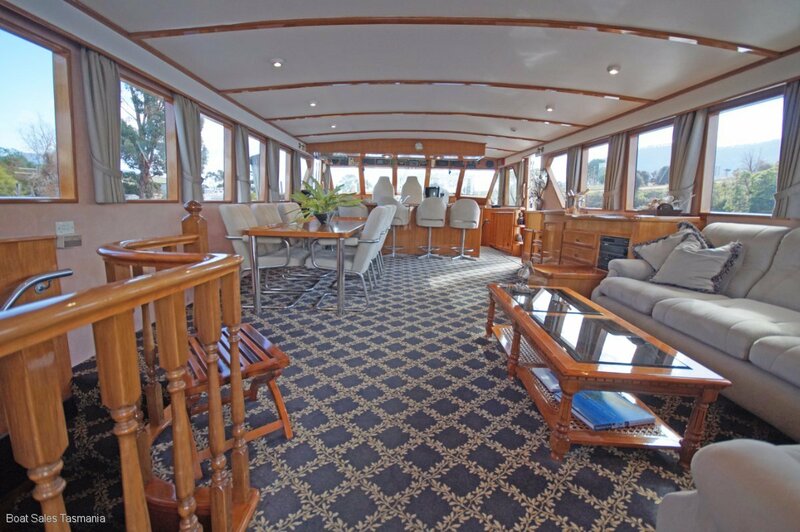 On board, the crew (and guests) cruise in absolute comfort. 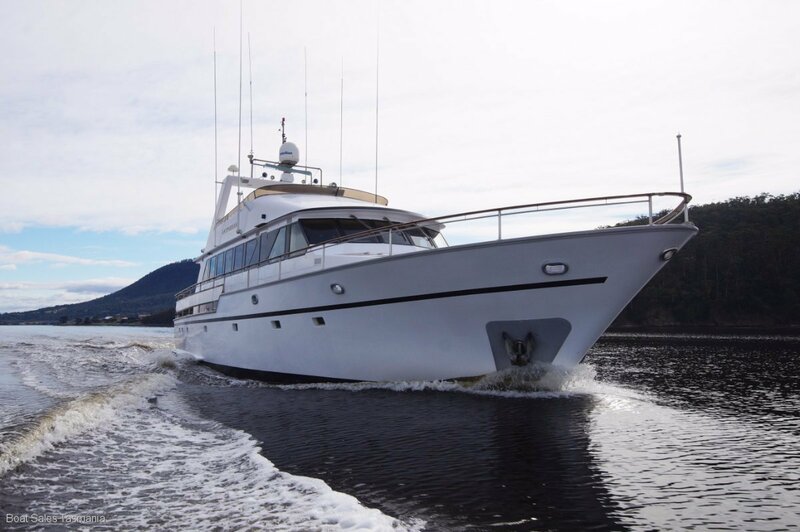 The comprehensively equipped bridge, the chef's galley, the five private cabins with ensuites and the magnificent saloon all make for a bon voyage. 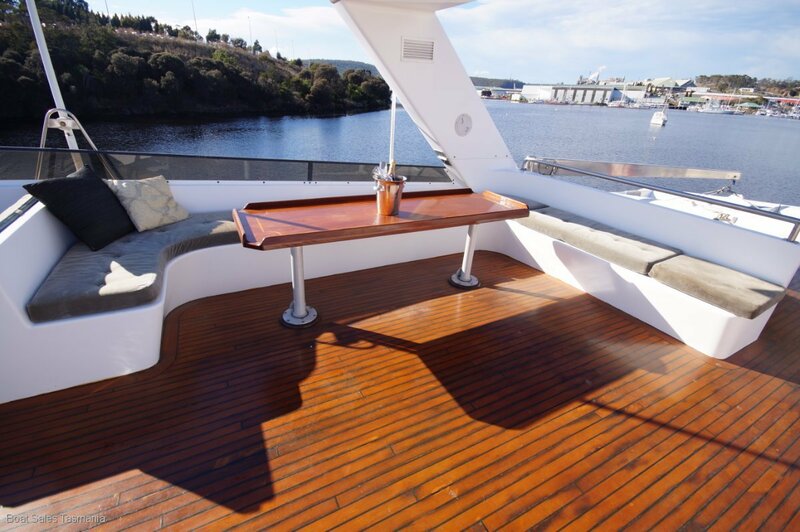 The standard of the fine teak fit-out is exceptional. The current owner is a retired master. 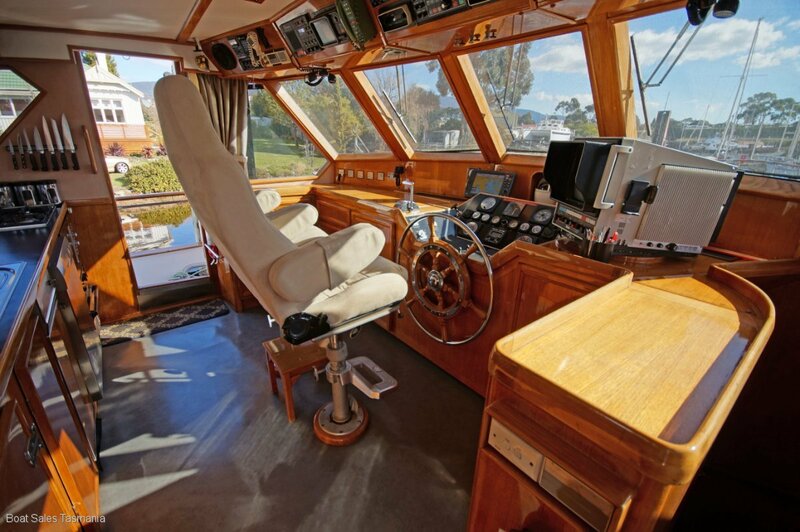 He and his wife owned a fleet of cruise boats on the West Coast of Tasmania. "Antipodean" is maintained to a professional standard. Gardner 8L3B rated 250 hp at 1250 rpm driving a 40" x 4 blade propeller. Twin Disc gear box. 3 to 1 reduction. Oil purifier. These famous, low revving, British engines are still favoured by commercial operators. Their reliability and longevity are legendary. 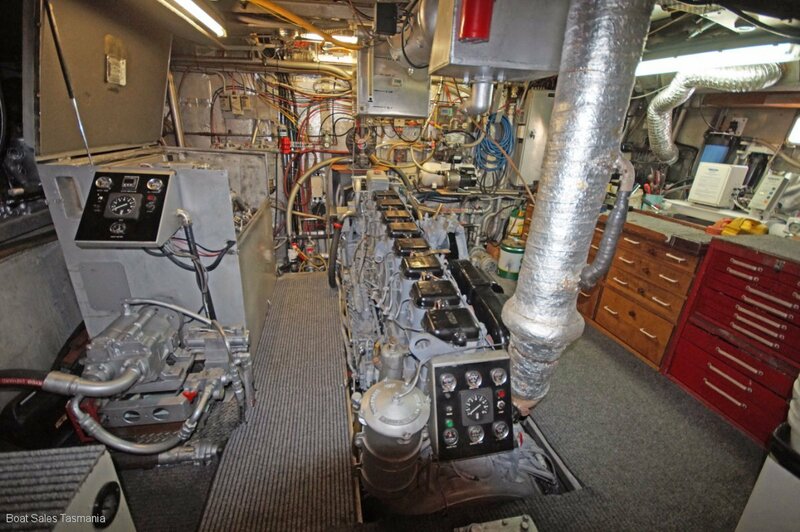 The superbly maintained machinery is located in a huge soundproofed (lead-lined deckhead) engine room which incorporates a workbench. 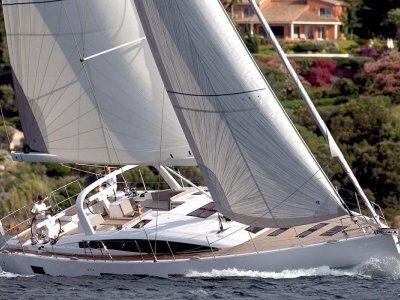 At a cruising speed of 9 knots (top is 10 knots), fuel consumption is around 20 litres per hour. The 14,000-litre tankage gives a range of around 5,600 nautical miles. Engine Hours. With 7061 hours logged (as at August 2017), Antipodean's main engine is just nicely bedded in. 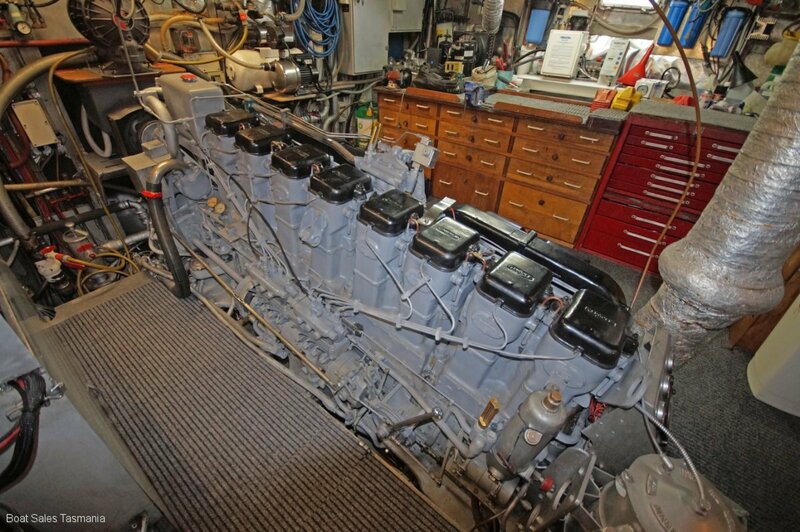 It should be noted that in Tasmania there are Gardner engines efficiently powering commercial vessels having done 80,000 plus hours. Engine controls. - air operated. Bow and Stern thrusters - hydraulic. Stabilisers - air operated. A bridge located CCTV camera monitors the engine room. Hydraulic Bow & Stern Thrusters plus "G&G Pnuematic" air-operated stabilisers. 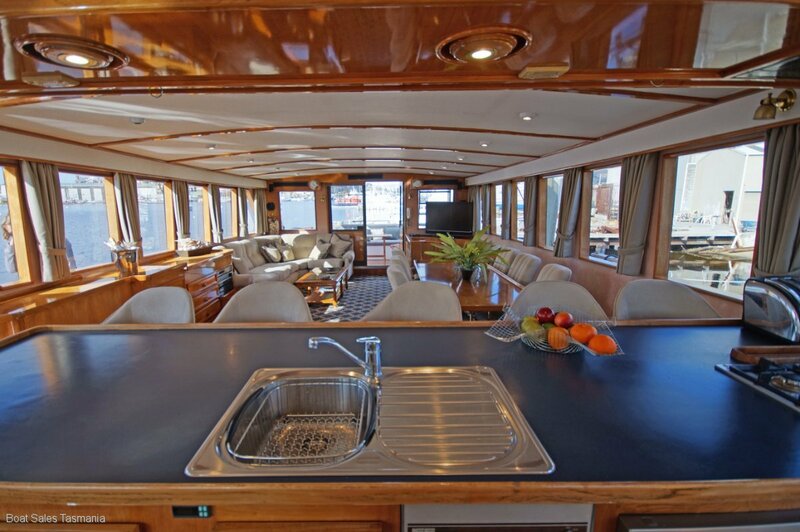 Step into the saloon from the aft deck and take a moment to just look around. Take in the ambience. The restful, rich decor, the finely crafted teak timber fit out and the light (and vision) afforded by the large windows. 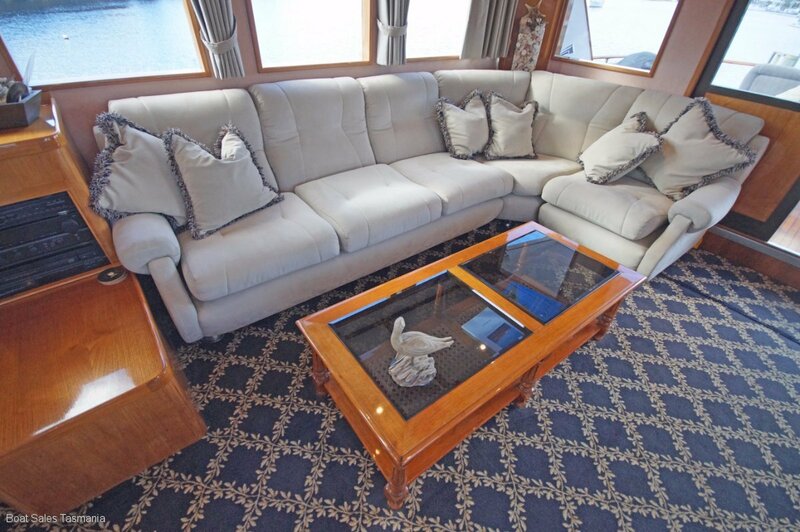 To starboard is the plush lounge with coffee table. Forward is the rich teak cabinet housing entertainment equipment, bar and bar fridge. 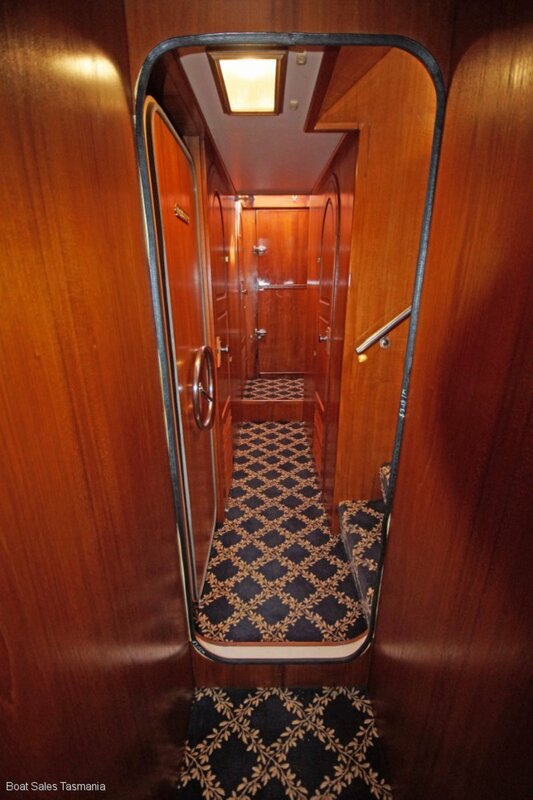 Immediately to port is the spiral staircase to the master cabin with en suite and soundproofed engine room. 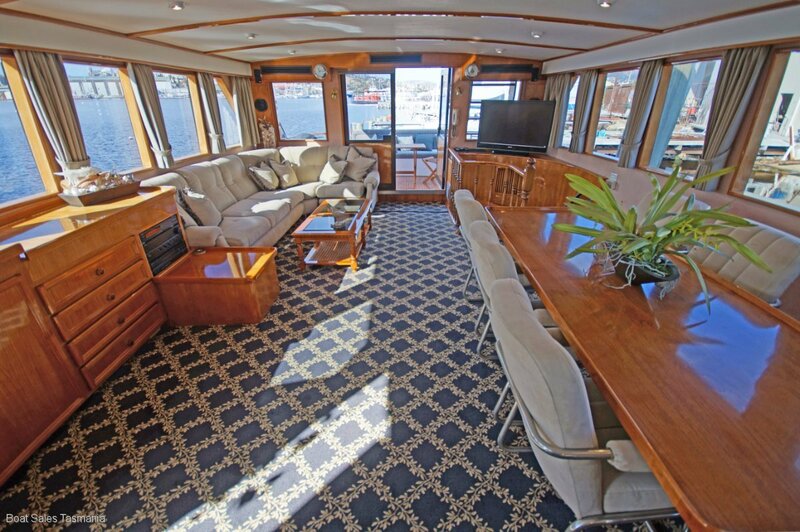 Forward and to port is the dining table (just aft of the galley bench and bridge). To starboard of the bridge/helm is another spiral staircase. Down the stairs to guest/crew quarters. *Two door freezer built into the forward bulkhead. *Laundry: Washing Machine. Fisher Paykel 5 kg (Smart drive 085), Malley's dryer. *Two by twin cabins (one to port and one to starboard). 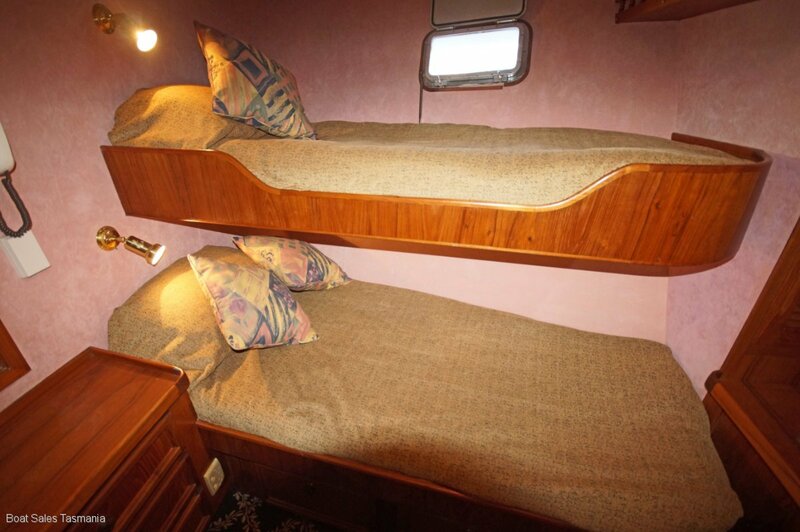 Bunk type single berths. 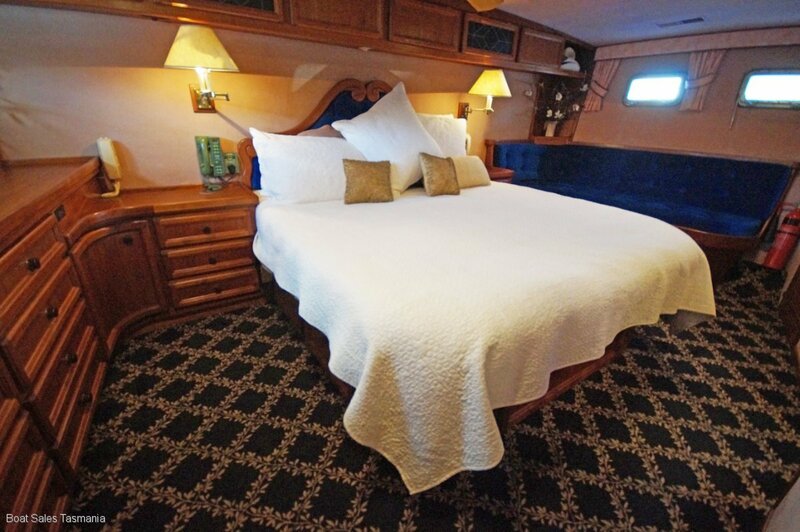 *Two by double plus single berth cabins (port and starboard) (each with 1 x double berth, 1 x single berth and ensuite). 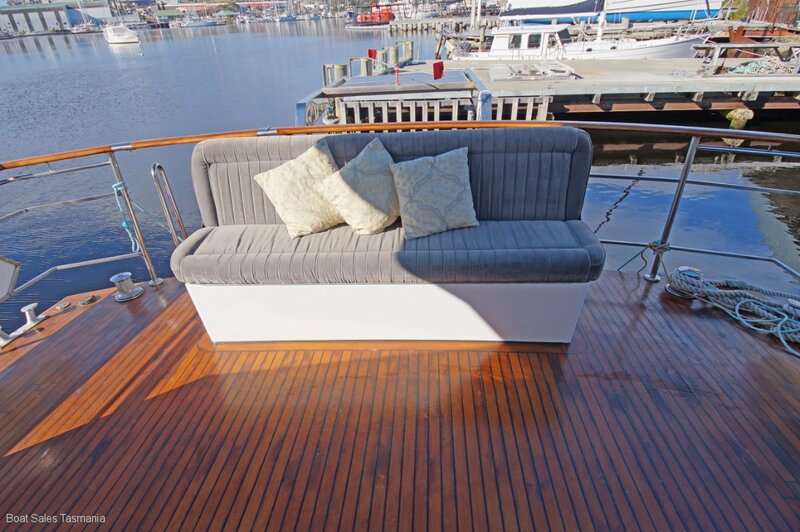 The flybridge is a great space for entertaining and relaxing with cushioned seating all round. Crew/guest comfort is enhanced by the air conditioning to cool (or warm) and the air-operated stabilisers to smooth the ride. Built to commercial survey standards all bulkhead doors are watertight. 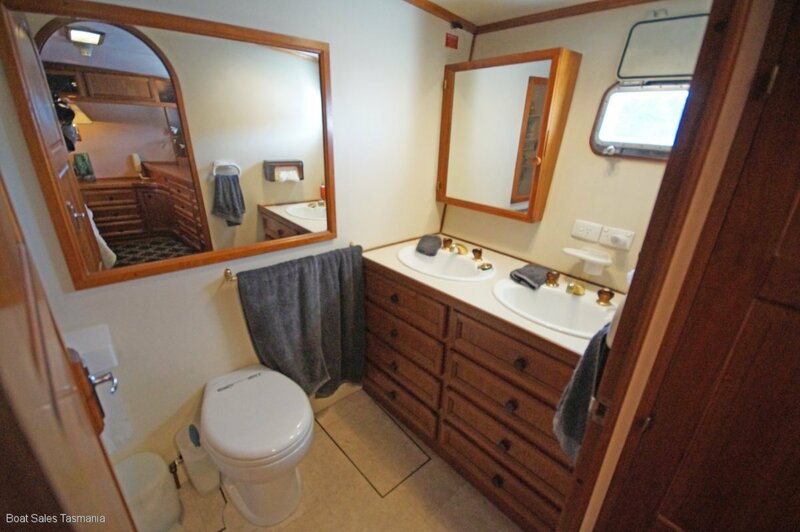 *AFT: Master Cabin with en-suite. Queen size bed. With walk-in wardrobe, large vanity unit, ample storage (drawers and second wardrobe). 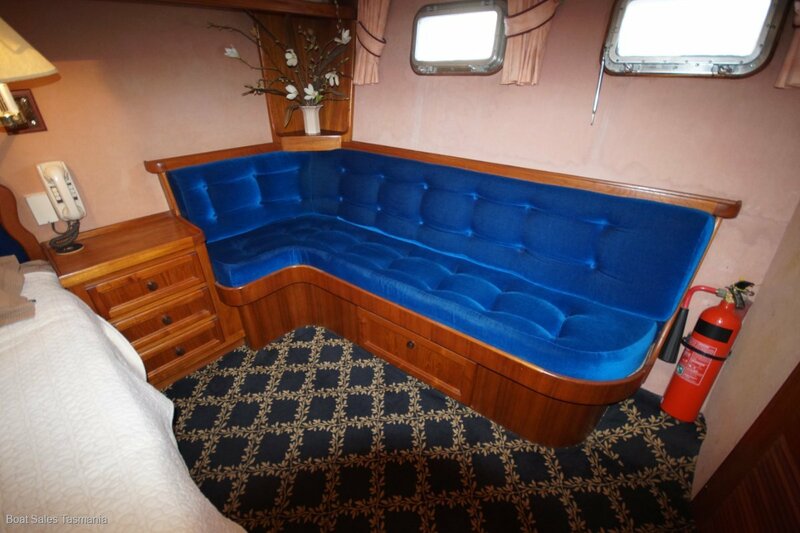 Plush settee, Bedside tables c/w reading lamps, VHF Radio, Intercom, wall heater, Panasonic Viera 32" TV. *FORWARD: 2 x Cabins port/starboard. 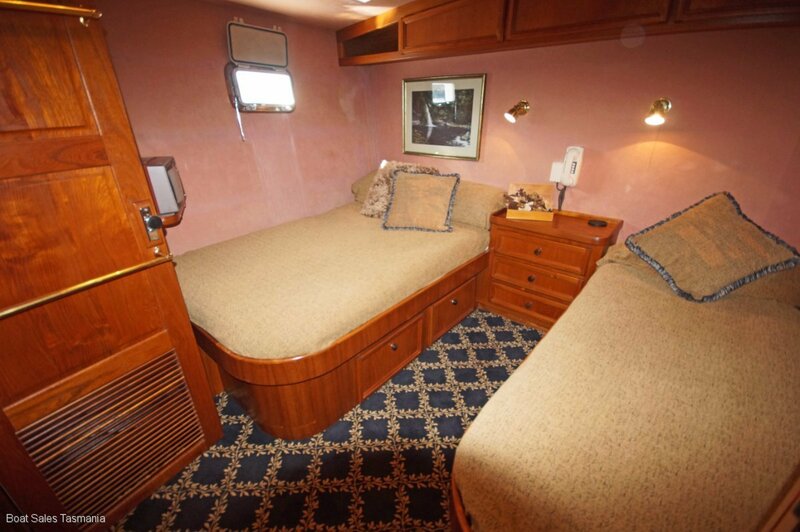 Each with 2 x single berths (bunk style). 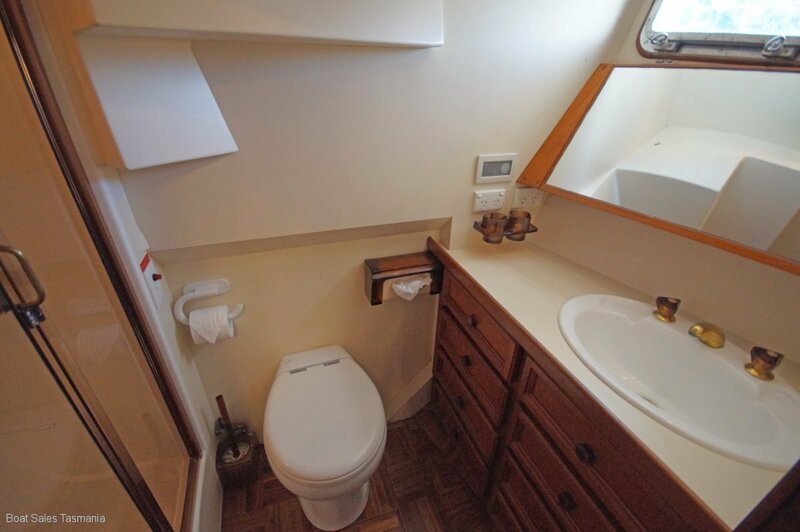 Reading lights, double vanity, storage drawers, shared bathroom, intercom. *MIDSHIP: 2 x Cabins port/starboard. 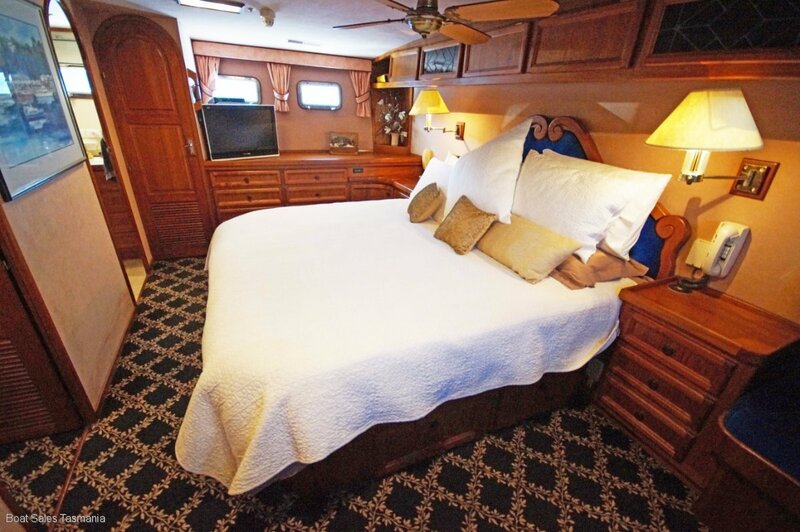 Each with 1 x double berth, 1 x single and en-suites. Reading light, storage drawers, vanity units, intercom. 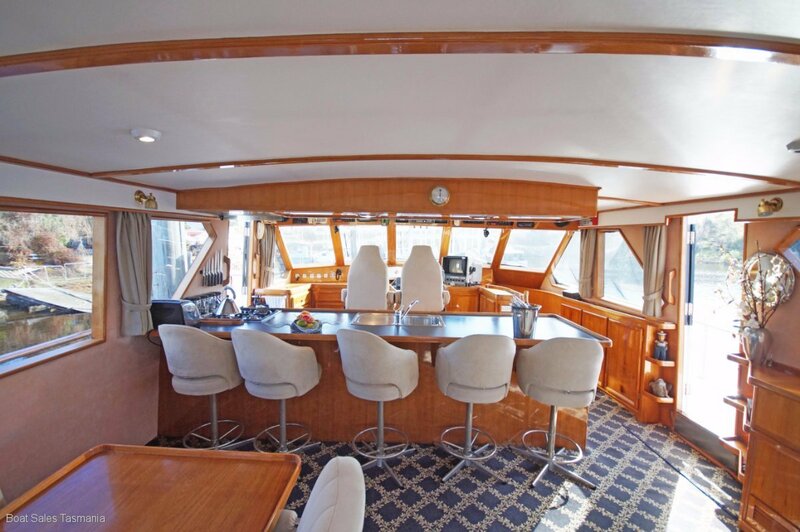 The galley is immediately aft of the bridge facing the saloon (and the dining table). Almost the complete width of the saloon it offers ample bench top and storage space. 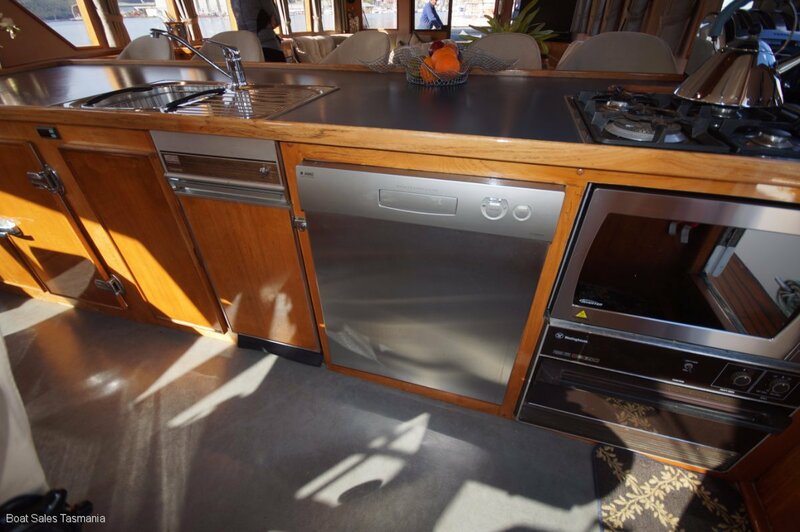 The galley is equipped as befits a vessel of this calibre. *Deep stainless steel sink/drain board with mixer tap. Aft Deck: Engel upright fridge. Large two door Freezer integrated with foward bulkhead on accomodation level. 1 x vacuum flush, 3 x electric Tecma toilets. Holding tank - 2000 litres. TV: Sony Bravia 46" TV/DVD player. Yamaha 40 hp 4 stroke 142 hours for the Avon. No outboard for the Aquapro 2.4. Twin ships Naval anchors retained snug in hawsers. Approx 90 metres of chain per anchor (Starboard 1/2", Port 5/8"). Pekin Engine room fire protection system with bridge monitor. Manual extinguishers throughout. Alternator 415 volts, 3 phase. 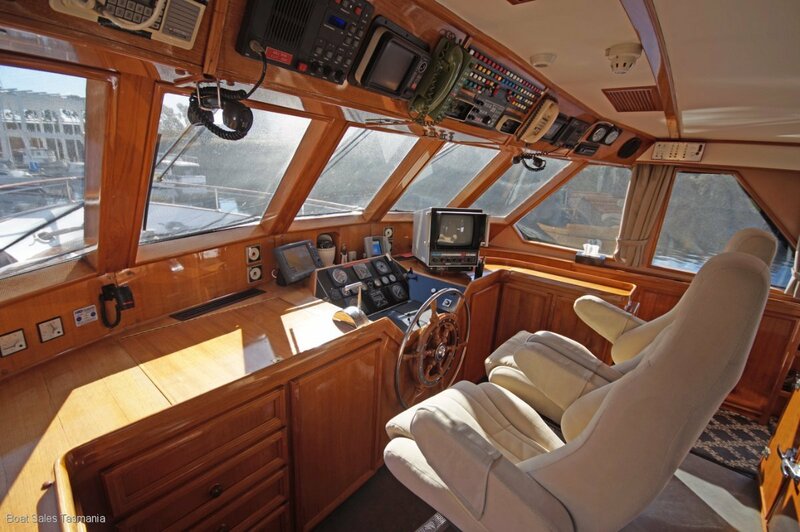 VHF: Sailor VHF at the bridge, flybridge and master cabin. GME VHF backup at the bridge. Intercom with receivers in every cabin/compartment. 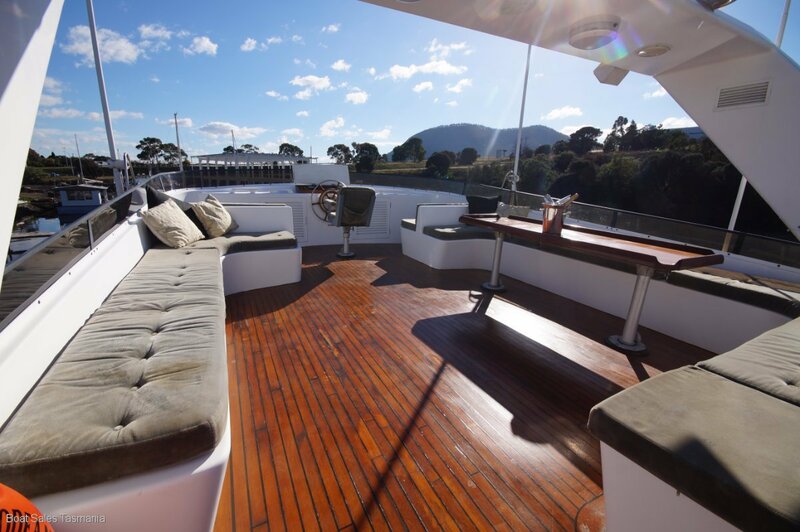 Main deck general: High bulwarks with stainless steel rails and teak capping provide walk around security. 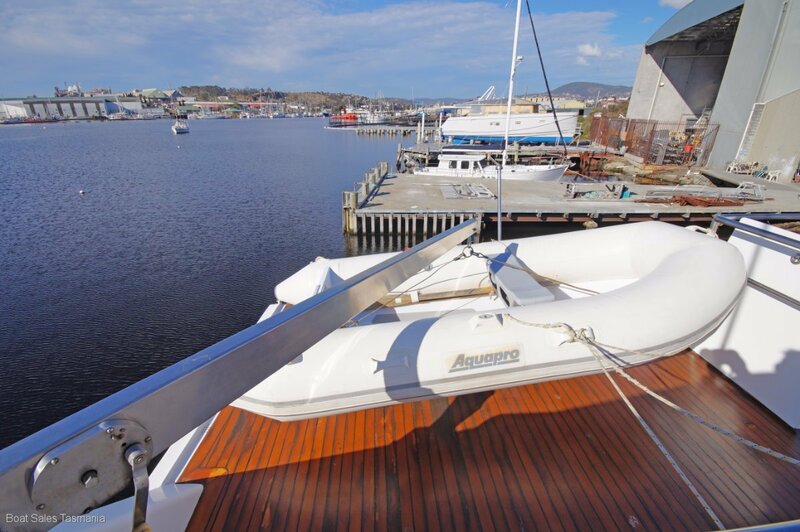 The side and stern gates provide easy boarding access. Side door access the bridge. 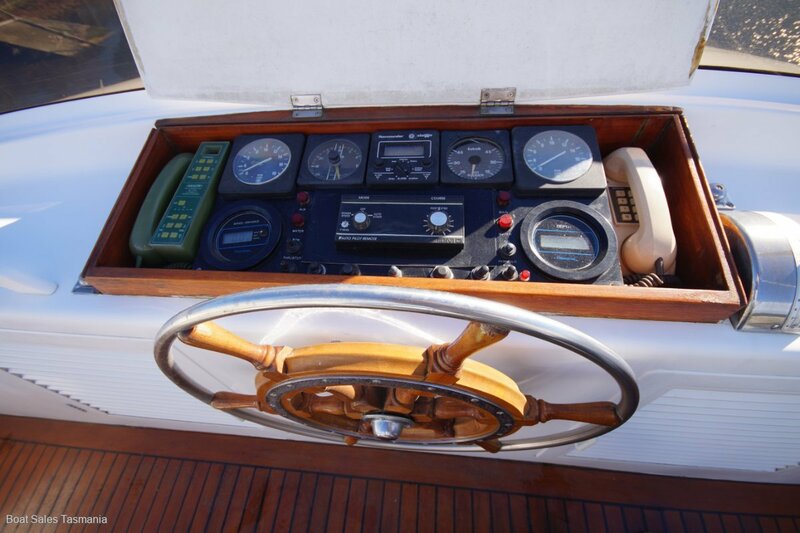 Foredeck: Large deck lockers for lines, fenders etc including a deck hose on a reel. Access to the chain locker. Food prep. Unit with S/S sink with drawers and fridge under. Freshwater deck wash hose is stowed in this unit. A lazarette (huge) with ladder access. Contains a diving compressor with a hose on a reel, general purpose mooring lines on a reel. It also houses the steering gear. 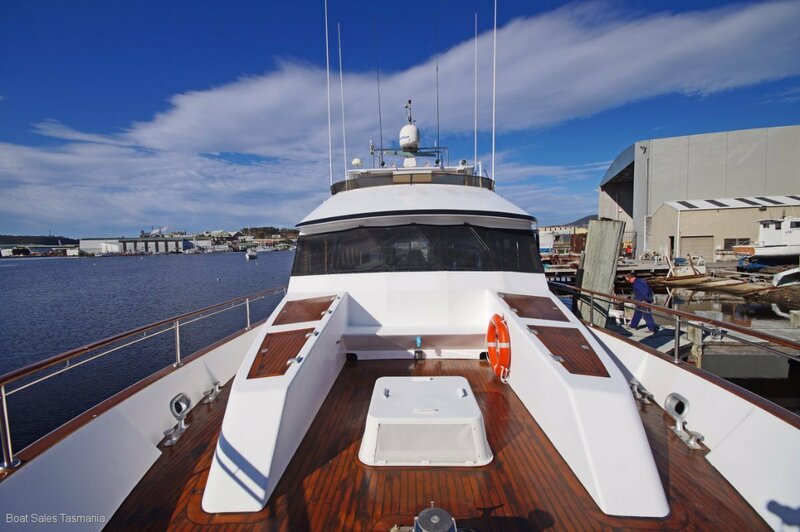 A large boarding platform and substantial stainless steel davits with power winches. Capstans (24 v) port and starboard. Deckwash fore and aft decks. Top deck. 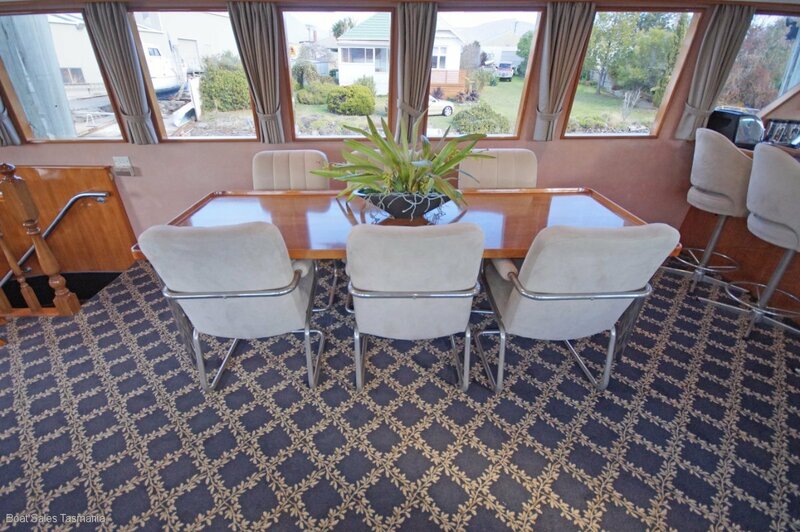 It is an open deck (large space) with cushioned seating all around. The antenna array is on the hinged Targa bar Aft of the targa bar is a sub-deck with dinghy chocks and crane for the 2.4 m inflatable. This remarkable vessel will be understood and appreciated by a true mariner. The replacement cost is inestimable. 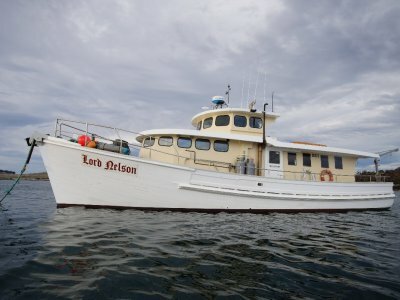 She is priced to sell as the owners are at that time in life when it is time to bury the anchor.